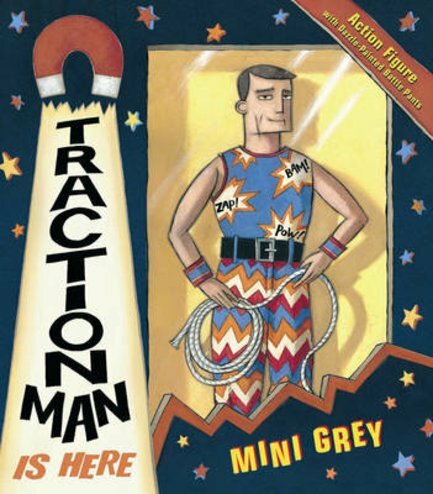 With an action outfit for every occasion, Traction Man patrols the house. Whether he is saving toys (in latex space suit and Perspex helmet, teamed with Rocket Boots); searching the sink for the lost wreck of the sieve (in sub-aqua suit, fluorescent flippers and infra-red mask) or rescuing damsels in distress (in jungle pants, camouflage vest and a bandanna), Traction Man is never less than stylishly turned out and expertly accessorised. He is the last word in heroic fashion flair – until, that is, the day that he is presented with an all-in-one knitted green romper suit and matching bonnet by his owner’s granny. Can Traction Man overcome the humiliation of his desperately dowdy new look and rediscover the action hero within or will the burden of the knitted green monstrosity be too great?